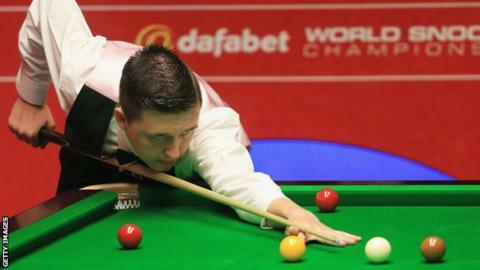 Kyren Wilson says he has to raise his game significantly to stand a chance of beating defending UK champion Neil Robertson in the second round. Wilson, 22, was pleased with how he "dug in" to scrape through a first-round final-frame decider against Gary Wilson on Thursday night. And the world number 64 faces Robertson on Sunday. "I played alright but I will obviously have to improve a lot to beat Neil," he told BBC Sport. "But there is room for a lot of improvement. "I missed about three cut-back blues to win frames and made it hard for myself, so when he missed the pink in the last frame I felt like hugging him. I was just glad to get over the line." "I seem to be starting well at the minute, but my concentration keeps fading. I don't know if it is because you get a buzz before you are about to play and once you have had a couple of frames you lose that buzz. "I have to try to work on that and hold my concentration throughout the match. But I dug in and got through." The Kettering cueman, who faces Robertson on Sunday afternoon, had an impressive debut year on the tour last season. He won six matches to reach the quarter-finals in the Shanghai Masters and was tipped by many to be a top-16 player in the making. Last season gave Wilson plenty of belief and he is not daunted by the challenge of taking on a Triple Crown winner, despite finding life tougher this time around. "My form has not been great this season," said Wilson. "Last year I took off and did well. I hit the ground running and did well in Shanghai and I haven't done the same this year. "Maybe this could be the turning point. "You only need one good run in a tournament and your confidence comes back. "I am not a surprise package any more. Last year I was a bit unknown, but now people know what to expect. "Neil's a top player but I am not bothered. It will be nice to play a big player." Robertson and Wilson share a passion for Chelsea - and the pair have been united in giving mutual Arsenal-supporting pal Joe Perry some good-natured stick. "I love it," Wilson said. "I practise a lot with Joe in Cambridge and I am quite friendly with Neil. "When I go to the club Joe's very anti-Chelsea so I jump on Neil's side. It might not be as friendly on Sunday."